One of our many passions at Nicki Macfarlane is a beautiful bow – we never tire of seeing them on our dresses! When Nicki was preparing for her latest article for the lovely website Wedding Planner, there was a general consensus in the office that bows epitomise happiness! Whether it’s a perfectly wrapped gift, a little girl’s hair, a beautiful party dress or a wedding day – these happy things are all enhanced by a beautiful bow. 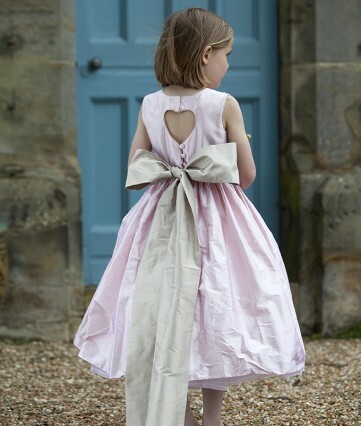 Many of our flower girl dresses, First Holy Communion dresses and party dresses feature a silk sash bow which is tied at the back – a look that exudes tradition and a quintessential Britishness that we’re extremely proud of. Some of our styles have bows tied at the front, such as Claudette or our organza bows give a different, ethereal look (see Organza Mirabelle). When it comes to accessories, our love of bows continues. Our hair bands with large bow or buckle bow can be made to match your girl’s dress or sash – the perfect finishing touch. We also have a range of bow clips which come in a variety of colours. We are often told that we make tying a bow look easy, but it’s fair to say we do get a lot of practice! Over the years, some of our clients have asked us how to tie the perfect bow and so, with this in mind, we decided to create a video which gives you a step by step guide to tying a sash bow on a dress. Click here to see the video. To see Nicki’s article on The Joy of Bows on the Wedding Planner site, click here. This entry was posted in General, Interviews & Features, Videos. Bookmark the permalink.